Ok mamas, so what's the deal? Can we really "sleep train" an infant? I called my mom yesterday to ask her if she had used any sleep training methods for me or my brother and she said "sleep what!? "....so I'm guessing this was not the jam in the '80's. Leave it to the Millennium moms to be the over-scheduling generation from infancy. I decided that our trip would be the perfect time to start my baby sleep research and frankly, I can't tell if I really believe that some of this stuff can work or if I think it's just a life raft for parents-to-be who are terrified of the newborn/infant stage. I read On Becoming Babywise poolside and my first thought is that the best way to get a baby to sleep is to read Babywise out loud to them. It certainly worked for me. That book is booooring....and wordy....I mean, give a girl a break! How about a bulleted list and a handy chart or two for easy reference? On the upside, I can see that there are a few tips and practices that I think sound reasonable and realistic. I will attempt to implement some of these when the babe is old enough but not too old because then all hope is lost (!) (and if he doesn't have colic, reflux, GERD or a generally fussy temperament). Any advice out there? Is all of this pointless? 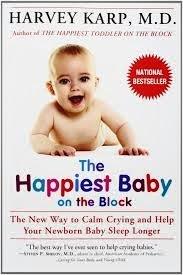 I started reading Babywise too and I agree. Snoozefest!! However I do see some good points in there and I'm hoping I'm not too tired to remember them when needed! In the 80's my mom always had dr. Spock on hand. Lmao I still remember that book! My cousin had good luck with babywise! We used babywise with our first (second is due in September and we will do the same). Our first was a dream baby--I don't know how much was just his personality (since he is certainly not a dream toddler!) and how much was using the babywise schedule. The biggest thing for us was to let Jack learn to put himself to sleep--so no rocking to sleep, no swing, no nursing to sleep (except for middle of the night feeds). Jack was sleeping through the night with a dream feed by 3 1/2 months and from 7:30 p.m. to 7 a.m. (without a dream feed) by 5 months. Check out babywisemom.com. Her website is really helpful! We swear bt The Happiest Baby on the Block! It totally works. We tried the babywise sleep training and it helped immensely to get our babe on a schedule. She was still a crap sleeper (didn't go thru the night til 9 mo) but it made sleeping a lot less crappy! Also, the swing was a LIFESAVER. Get one that plugs in or you'll use a zillion batteries. 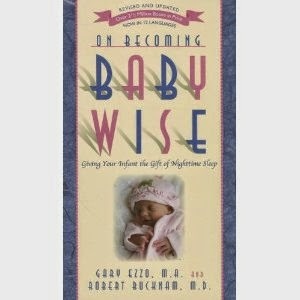 I never really got Babywise when I was reading it pre-baby. I was confused and felt like Ineeded to take notes and it stressed me out. Then all of the sudden it clicked. I found myself going back and reading passages and things just made sense. And it worked, man, it worked. at 8 wks my little boy was sleeping 11-7 and by 10 wks he was sleeping from 8-7. Lifesaver!